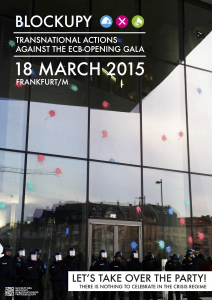 March 18th 2015: Transnational actions against the European Central Bank’s opening gala – Let’s Take Over The Party! On March 18th 2015 the European Central Bank (ECB) wants to open its new headquarters in Frankfurt. A dizzying 1.3 billion euros was spent on a 185-meter-high fortress-like twin tower building, surrounded by a fence and castle moat. This intimidating architecture of power is a perfect symbol of the distance between the political and financial elites and the people. The staff and the offices have already started to move there. But the grand opening gala – with several European state leaders and the European finance oligarchy present – has now been announced for Wednesday March 18th. There is nothing to celebrate in austerity and impoverishment! Thousands of angry people and determined activists from all over Europe will therefore block the roads around the ECB and interrupt this celebration of power and capital, fittingly on the 144th anniversary of the Paris Commune. We will take over their party and turn it into an articulation of transnational resistance against European crisis policies and their catastrophic consequences, especially for the people in the European south. The ECB plays an important role in the infamous Troika, responsible for harsh cuts, growing unemployment, and even the breakdown of healthcare in Greece and other EU countries. Along with the EU Commission and the EU Council, the ECB has promoted austerity, privatization, and precarity. They have even had no hesitation in blackmailing elected governments in order to enforce their attacks on the social rights of the people. As the crisis has unfolded the EU has became more and more of an authoritarian regime with an obvious lack of democratic participation. The murderous border controls and the progressing militarization of foreign policy add to this process. They cannot, and even do not want to, represent us anymore. The ruling elites have nothing left of value to offer for us. But new forces are emerging from all corners of life and it will be our task to build solidarity and real democracy from below. They want capitalism without democracy, but we want democracy without capitalism! At the same time we have to be very aware of the dangers of growing racism and the rise of the extreme right, this ugly by-product of the capitalist crisis. While it’s their intention to heighten the borders both around and inside Europe, our aim is just the opposite: to break down the walls of fortress Europe. While it’s true that there are no longer frequent emergency meetings for the salvation of the euro or the solvency of certain member states, this does not mean at all that the crisis has passed. For some countries the shock strategy is far from over with new harsh austerity measures being imposed. For other countries we are facing a new normality of uncertainty and of poverty. Either way it has long since become clear that the policies implemented during the crisis were not meant to be temporary – they have been safely embedded into the state and EU institutions. This has paved the way for a new phase, a model of society of precarity and very limited social rights. But we refuse to get used to it! Germany is one of the main driving forces behind this austerity policy. In a way it’s the heart of the beast of the European crisis regime and the relatively quiet eye of the storm at the same time. But limitation of social rights, growing precarity, and poverty also exist in Germany. There a many reasons for the people living in Germany to stand up for a decent living, for equal rights, and for real democracy for everybody regardless of their descent, gender, or nationality. 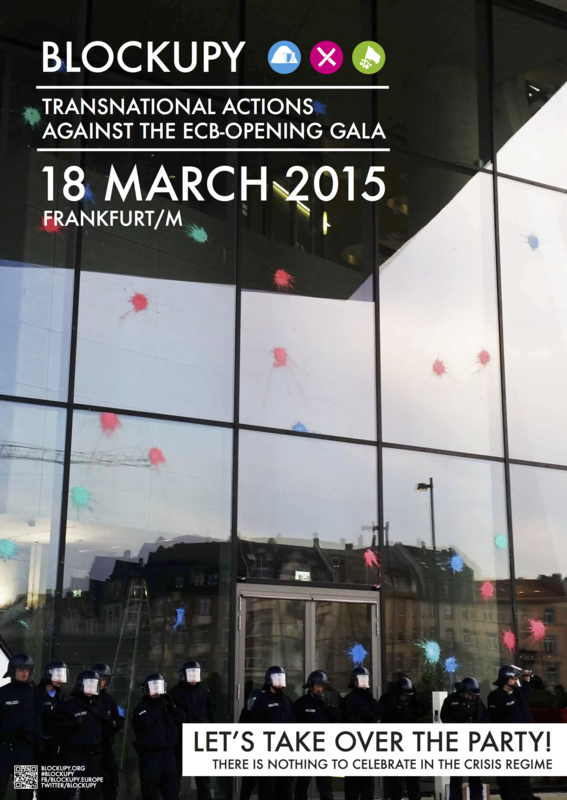 The actions against the European Central Bank’s opening gala in Frankfurt will be the perfect occasion to send a clear signal of solidarity alongside with all the activists from other countries. For all these reasons we call for a strong international participation in the actions on March 18th in Frankfurt. There will not only be a disobedient mass action on March 18th itself, but also a diversity of demonstrations, blockades and other forms of direct actions around it. The Blockupy Days of 2012 and 2013 were only the beginning. The protest and the resistance will come back to Frankfurt – stronger in numbers and in determination than ever before! We are various social movement activists, altermondialists, migrants, jobless, precarious and industry workers, party members and unionists and many more from many different European countries, who want to connect our struggles and powers beyond nation-state lines. Together we want to create a common European movement, united in diversity, which can break the rule of austerity and will start to build democracy and solidarity from below. Blockupy and the actions in Frankfurt are only one step along this way.